Indoor U.S Flags and Sets are a great way to express your American patriotism. No matter whether you are planning to use our superior quality indoor US flags for staging flags in classrooms, fraternity lodges, offices and more, they will surely leave a lasting impression to your audience. Crafted with the finest materials, our flags are designed to last for a very long time. Our Indoor flag sets includes eagles, spears, poles, bases, and tassels to ensure a seamless display and a dramatic presentation. We offer the best rates and the largest selection in US flags and sets. 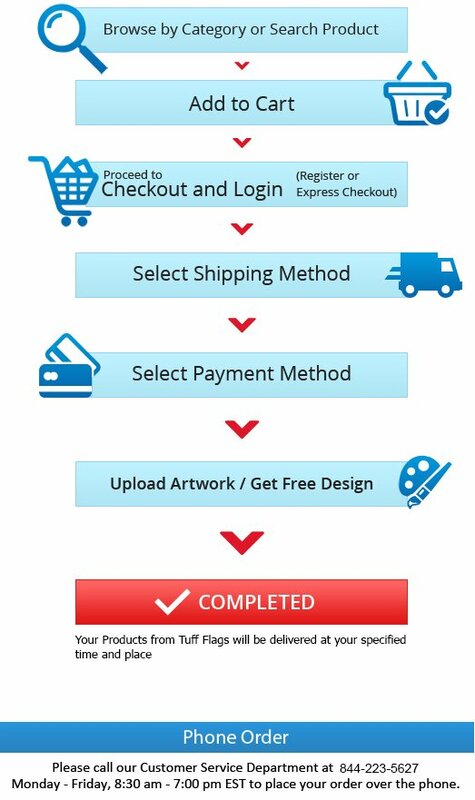 Shop right away and get the best prices, quick shipping and much more! 100% customer satisfaction guaranteed! An Indoor American flag will make a perfect addition to any lobby, public space, office, church, school or even your own home! Tuff Flags offers a fabulous collection of both fringed and unfringed indoor flags to match your needs and flag pole sets for a perfect display. 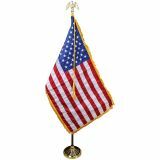 Our Indoor flag sets include a weighted gold colored base, polished oak pole, tassels, eagle top and the US flag with embroidered stars, and sewn stripes. All our indoor flags are all made in the USA. From the soft and silky nylon flags or the classic cotton, we have indoor flags of all possible types. Our Indoor flag sets are designed to provide a dramatic display for all business settings and public meeting areas. Created with the finest materials, our flags feature rich brilliant colors that make them well suited for indoor presentations and parades alike. These will make great gift items during Independence Day or other national holidays. 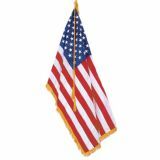 Buy these US Made Indoor Flags and Sets today to highlight your American pride in style! 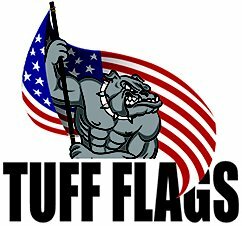 Should you need any assistance in shopping for US Made Indoor Flags and Sets feel free to call us at (888) 287-3524 or email us at customercare@tuffflags.com. We would love to be there for you if you have any questions.